So you think you’re a big, bad monster? You’ve destroyed the city of Tokyo, fighting off all pretenders to your giant monster throne and you’re hungry for more? Want to take a bit out of the Big Apple? Are you tired of me asking questions? 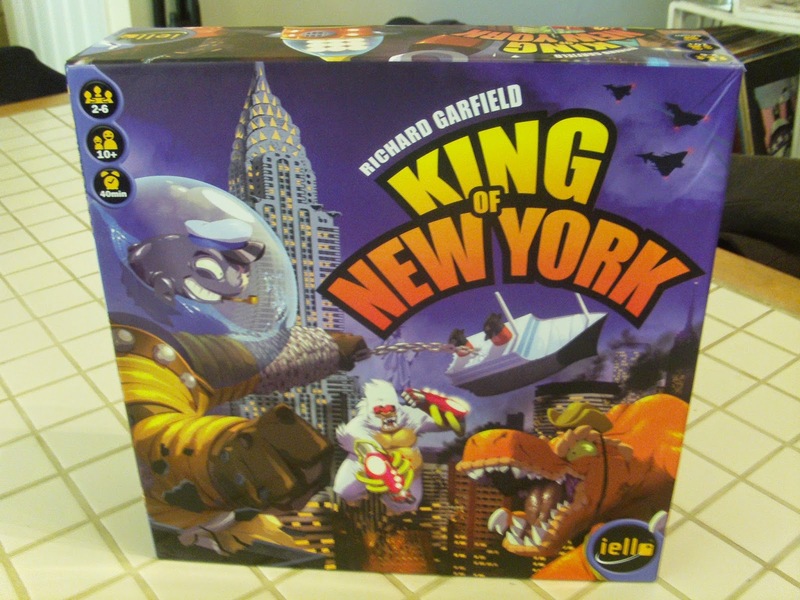 Well, you’re in luck because this week, we’re reviewing King of New York, a smashing game for 2-6 players and spiritual sequel to Iello’s other giant monster game, King of Tokyo. Does it measure up to its smash-hit predecessor? Let’s find out. King of New York shares many similarities with King of Tokyo. Just like King of Tokyo, each player is a giant monster wrecking a city in an attempt to be the biggest, baddest monster around. Just like King of Tokyo, a player wins by either accumulating 20 points or being the last monster standing. Just like King of Tokyo, on your turn you roll six dice up to three times. You can still use the results of those dice to deal damage to other monsters, heal damage other monsters have dealt you, or earn energy cubes you can spend to buy powerful new abilities for your monster. So, where does this game differ from King of Tokyo? Well, for one thing, this has a much larger board. The board shows a map of Manhattan and its four surrounding boroughs (Staten Island, Queens, The Bronx and Brooklyn) with Manhattan being the prize everyone is fighting for. What’s more, each turn that a monster stays in Manhattan they get to “move on up” to a better part of Manhattan, increasing their rewards. Make it to Upper Manhattan and each turn you start there will earn you two points and two energy cubes! Another way this breaks away from King of Tokyois the addition of three new symbols to the dice (replacing the 1’s, 2’s and 3’s that you used to earn points in King of Tokyo): Stars, Wrecked Buildings and Skulls. Roll three Stars and you get to take the Super Star Card. So long as you have this card, each Star you roll will earn you one point- but as soon as someone rolls three Stars, they get to take the card from you. Wrecked Buildings are used to destroy building tiles on the map. Each building you destroy will award you points, health or even energy cubes. But watch out- when you destroy a building, the tile is flipped to reveal a military unit that has come to defend New York City! This is problematic because of the Skulls. Roll one Skull and every unit in your borough will attack you. Two Skulls will make them attack you and any other monster in your borough. Three Skulls will make every unit on the board attack every monster in their borough- plus, it will award you a special card that grants you three points. Watch out though, because if someone else rolls three Skulls and takes that card from you, you’ll lose those three points. And this is the strength at the center of King of New York– that which in my opinion makes it a much better, more engaging experience than King of Tokyo. Often, when playing King of Tokyo (especially with five or six players) one could hide out in the background, quietly accumulating points while the other monsters duked it out. Not anymore, thanks to the units and Skulls. Everyone in this game is involved and at risk of losing health, which makes the game that much more interesting and engaging. So what else is good? Well, the new cards and abilities are much more well-rounded. Many of the more powerful, game-changing abilities come with a drawback, making it less likely that a single player will dominate the game early on through the use of an ability. The new monsters are fantastic looking and as an added bonus, are completely interchangeable with the monsters from King of Tokyo. So what’s the downside? Well, like King of Tokyo, this is a game that relies heavily on an elimination mechanic. While I’m normally not a fan of this, with games lasting only 20-40 minutes, you can fit several games into an evening easily. So don’t fret, everyone will get ample chance to stand astride Manhattan like the monstrous colossus they are. Yes, that’s right, King of New York is a fun, well-balanced, exciting and engaging game to play. In every way it improves upon King of Tokyo, while at the same time keeping what made that game such a pleasure to play. I believe that King of New York will soon surpass its predecessor in popularity (if it hasn’t already). So check this one out, dear readers. A Space Aheadheartily recommends King of New York. Want to be king of the hill, a number one? If you live in the Bloomington area, you can find this game at The Game Preserve. If not, check it out at your local game store. Support local game stores!